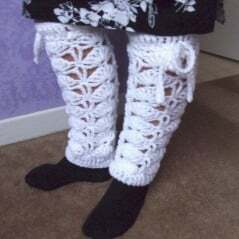 Crocheted leg warmers are one of my favorite ways to keep warm in the cold winter months. They are great for providing extra warmth and can be worn underneath pants, pajamas or even with long or short skirts. This leg warmer pattern could pass as a beginner crochet pattern, but it might be a bit more difficult due to the triple crochet stitches. 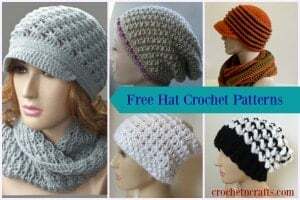 I’d say it’s the perfect pattern to try once the single and double crochets have been mastered. The size for these is easy to adjust, including both the circumference and the length. In row 18 I added slots for a string to help keep the warmers up. You could omit that row if you only want short ankle warmers or don’t want the string. Thank you Yolanda for volunteering to test my patterns. Your feedback is very much appreciated and I look forward to working with you again in the future. Finished Size: When Laying Flat it measures 5.5″ across and 15″ from top to bottom. Beg V-St: Ch 6 (counts as first tr, and ch 2), tr in same st.
V-St: (Tr, ch 2, tr) all in designated st.
Rnds 5-16: Rep rnds 3 & 4. Do more or less repeats for a longer or shorter length. Note that the following rnds will add another 2″ to the length. Rnd 20: Ch 1, sc in first st and in each st around. Join with sl st. FO. Bottom Edging: Attach yarn to any st, ch 1, sc in each st around. FO. String: Ch 90, working in bls, sc in second ch from hk and in each ch to end. FO. Weave into ch-1 sps of rnd 18.